Many varieties of pears are pretty plentiful right now, so a baked pears in the microwave seemed like a easy and fun thing to do. Now lets get on to the recipe. Cut the pears in half, the long way, and scoop out the core of the Pears with a melon baller. Arrange the prepared Pears in a microwave baking dish with narrow ends pointing toward the center. 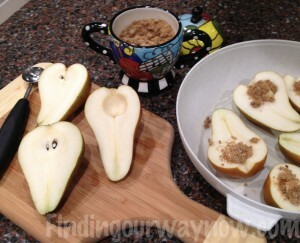 Place ½ tablespoon of brown sugar and ½ tablespoon of butter in the center of each Pear half. Cover and microwave on high for 1 minute rotate the baking dish and then finish microwaving for 1 minute. Test for doneness with a knife. The knife should slide out easily. Let stand 2 minutes. Place two pears on serving plates and spoon the light caramel sauce created by the brown sugar and butter over the pears and serve. Notes: Bosc pears work particularly well with the recipe. If you can’t find Bosc pears others will do, just be mindful of the density that of the pear and adjust your cooking time accordingly. The time required to cook well vary by the strength of your microwave; again you may need to adjust your cooking time. A general full of thumb for cooking these is; 4 Pear halves – microwave for 4 to 6 1/2 minutes, 8 Pear halves – microwave for 7 1/2 to 10 1/2 minutes. You can make this without the sugar, using a little apple juice concentrate in its place. I will occasionally add raisins to the pears placing them under the the butter before cooking. Sprinkling a few walnuts on top as a garnish is also a fun thing to do. These Baked Pears In The Microwave are as simple as it can get. 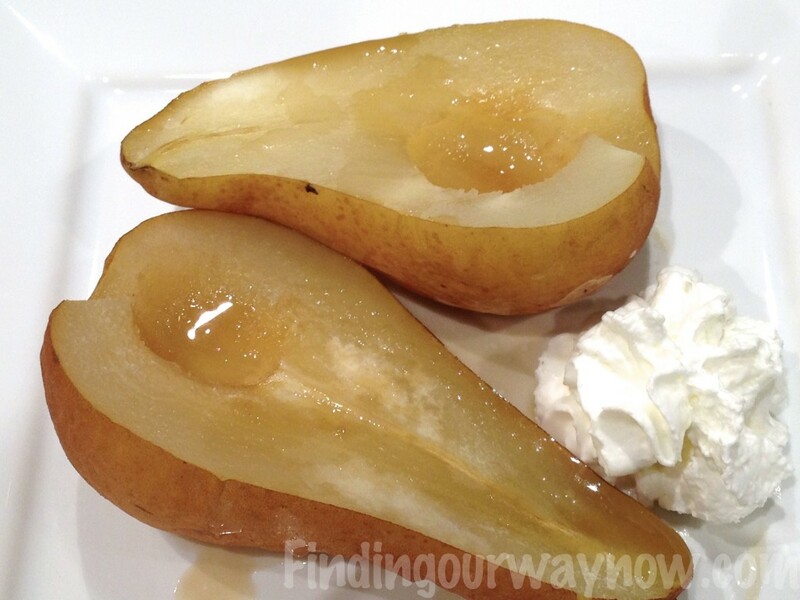 I usually serve these baked pears on a pretty dessert plate with some whipped cream on the side. So take a break and give yourself a simple and healthy treat with these Microwave Baked Pears. Enjoy.